Word traditions, delivered to your door. The goal of this school project was to create a packaging system for an existing product of our choice, or come up with a new brand. 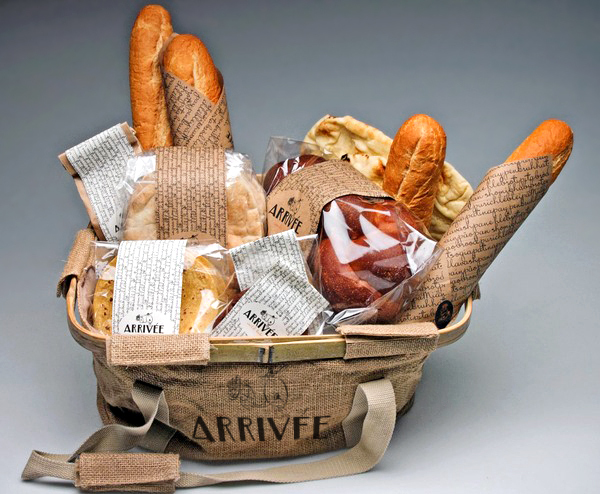 I came up with ARRIVÉE world bakery. “Arrivée”- is French for arrival, the bakery would have fresh bread delivery, and that’s where the scooter logo comes into play. The concept was to make fresh and organic variety of breads available to urban, health aware individuals and their families via weekly delivery to their doors. The delivery person would be using scooters to get around any given city in a more time efficient manner. Packaging would have to be simple and effective for the variety of breads including; hand-made tortillas, naan, lavash, pita bread, classic European-style artisan breads and other delicious options from around the world. I used natural and mostly low cost and organic materials that are good for the environment and easy to reproduce on a low budget. To show my branding abilities with environment in mind, I decided to incorporate natural and organic materials such as burlap, 100% cotton, and brown paper into restaurant-ware and employee uniform. Because I love working with typography I decided to create an image of the scooter from letter forms to give it a playful touch. LARISA MAMONOVA DESIGN / 2019 / SELECTED WORKS.